On this Sunday, my driver has moved our silver blue van through the streets of Metro Manila, out onto the Super Highway and we are driving to the province of Pampanga. The rain has been coming down for days and in the city, there are streets, flooded high to the knee. Debris floats like little islands drifting in the middle of a great river. When we get to the exit of Macabebe, the van slows down and we begin the slow wind to my father’s boyhood home. The streets are also rivers here and the wheels of the van slice through the waters. We pass the city hall where a statue of Jose Rizal rises over floodwaters. We roll slowly past the church, and the driver makes the sign of the cross, then kisses his fingers to seal the deal. Water is everywhere. The houses on either side of these unpaved streets float like barges. When we get to our house, I see a plank no wider than a foot placed loosely between the street and the front step. My Uncle Armando is sitting on the porch in a t-shirt and shorts, his flip-flops dangling from his feet. When he sees the van pull up, he waves and tosses his cigarette off to the side of the house, into the muddy waters. The house is like a playhouse, drifting elusively in the water. I must balance my way up the single beam. Even in the country, the waters are so dirty. Next to the porch, there is a little rowboat, dancing with the breeze. Every year, the waters come and flood the house where my father’s Auntie Charing now lives. This house that was once his house. Lola Charing, a long time victim of tuberculosis, spends her days on the wicker cot, surrounded by photos of me, my brothers and sister and my cousins in America. She shuffles through those photos every day, like tarot cards, reading the faces of each of us, memorizing each rite of passage we encounter – baptisms, first Holy Communions, graduations, weddings. The stacks of photos are piled six inches high. Behind her cot, there is a dresser and on the dresser are the watermarks from all the floods that have entered this house. She is my oldest living relative on the Galang side and she greets me as if we have known each other all our lives, though this is the first time I have seen her since I was three years old. Today is a good day and she is feeling feisty. She points to the graduation photos of my father and his brothers and sisters. They are lined high up above the doorways. Surely the floods will never reach them. When I see the photos, I am blown away. High up above the doorways I see visions of my brothers dressed in caps and gowns, cast in sepia-tone. And there is a photograph of Lola Charing graduating from pharmacy school, long before her bedridden days of tuberculosis. Is it possible that I am seeing my own face? The high cheekbones, the angular jaw, the lips. Are those my lips? So Uncle and I leave the house. We climb the little rowboat and then he paddles me down the streets of Macabebe. We drift down the canals and wind our way into the cemetery. The graves rise high above the ground. We must maneuver the little boat around the concrete caskets. The branches of trees submerged in water hang low and every now and then we must duck. At times, we find ourselves tangled in the brush. “Saan sila, Uncle? Malapit na tayo?” I am searching past all the graves, looking for a marker. There are stone angels and Mama Marys standing among the tombs, gazing out onto the water. No sign of the Galangs. “Ito na,” he says, pointing past a tree, shifting the paddle right and left and turning the boat around a large headstone. They are just around the corner. The grasses are thick. We are stuck. We cannot get to them. But from here I can see my grandparents. 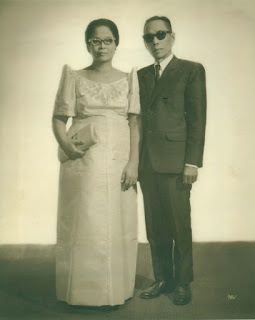 Miguel and Nicolasa Galang. They have been laid in one tomb, one long cylinder. Their names are etched where the tomb has been sealed. The weeds are too high and the water so black. We cannot get to them. But I am near and I can feel them. I can almost imagine their ashes swept together, dusting the floor of that tomb. “Nandito ako,” I tell them. I am here. I am here. Floating, but I am here. Entrancing journey to a physical place that you have always carried spiritually. Alignment with the ancestors, a necessity to maintain equilibrium and centeredness. Lovely post, thanks! Beautiful moment, thanks for sharing...Mabuhay!